The IMF is due to make its decision on whether the Chinese RMB will be included in the SDR basket (see Chart 1) as early as November and requires approval by 70% of the fund’s voting shares, of which the US holds 17%. The US has even greater reason to adopt a more conciliatory tone on the currency. Firstly, from a political perspective, resistance to RMB inclusion might just be a battle it cannot win. While the recent RMB devaluation was unpalatable to exporters worldwide (not only in the US), the longer-term trend has been toward gradual appreciation. The RMB has appreciated over 20% versus the US dollar since abandoning its strict dollar peg regime in 2005. The IMF declared the currency “no longer undervalued” in May, a position reiterated since then. In the words of Fung Global Institute senior fellow Guonan Ma, the US is “losing its alibi” on the under-valuation of the RMB. capital market investments. Empirical evidence of over-reliance on dollar-denominated funds might be seen very clearly in the allocation of sovereign reserves (see Chart 2). Just by looking at the composition of reported reserves (ex-China) it is evident that central banks are comparatively overweight US dollars in comparison to the dollar’s overall weight in trade and investment, which the SDR attempts roughly to replicate. Following this logic, one way in which global policy-makers might attempt to reduce this imbalance is to support RMB convertibility and usage, with the goal of promoting greater overall stability in the global financial system. As such, it is possible that the RMB’s inclusion in the SDR is, in the words of IMF Managing Director Christine Lagarde, “a matter of time”. If indeed the RMB is included in the SDR basket, the flow (in absolute terms) has potential to be massive. 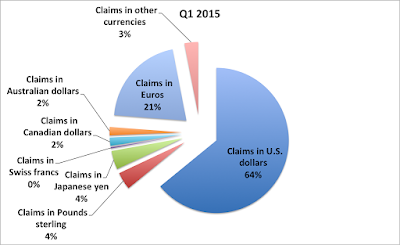 According to estimates by Standard Chartered Plc. and AXA Investment Managers cited in the media, at least $1trn in global reserves may convert to RMB assets upon SDR inclusion. The size of this flow would be equivalent to roughly 1.4% of the global asset management industry worldwide ($76trn according to IMF statistics). The significance of SDR inclusion, whilst high in the visibility of many global fund managers (private and sovereign) may still be under-appreciated in Australia. Only 18 out of roughly 100 attendees at the first of our RMB Thought Leadership conferences in Sydney viewed China’s bid for SDR inclusion as a significant development for the internationalisation of the RMB. Superficially, this is understandable. Despite the RBA’s very public inclusion of RMB assets in its reserves, Australia’s share of global foreign reserves (an external debtor nation) is a small one. Notwithstanding, more than one expert panelist at our Sydney conference saw SDR inclusion as having long-term significance beyond reserve denomination alone. 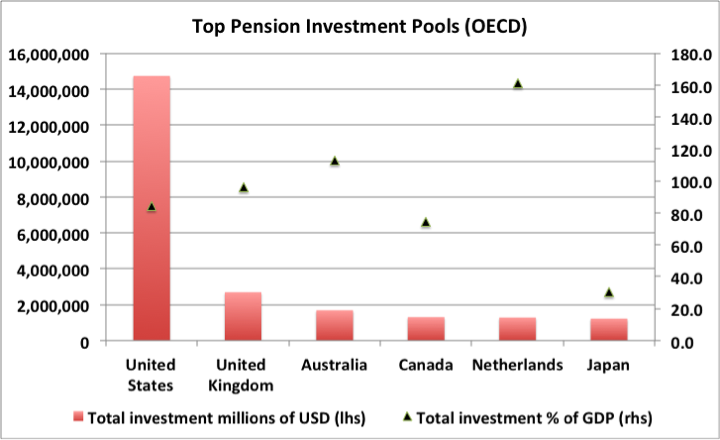 The logic behind this view becomes clear when considering that Australia punches far above its weight in terms of pension investments. 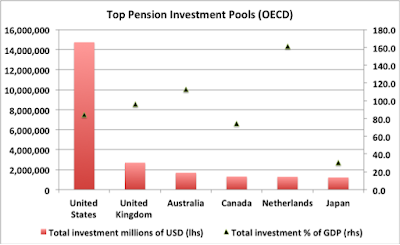 In Chart 3, we see that Australia’s pool of pension assets ranks among the top 5 nations in the OECD in absolute size, worth roughly 113% of Australian GDP as of May 2015. Yet given the significant home bias of Australian superannuation assets combined with the near 8% drop in AUDUSD, the value of funds under management have doubtless fallen since May from the reported US$1.685trn equivalent. 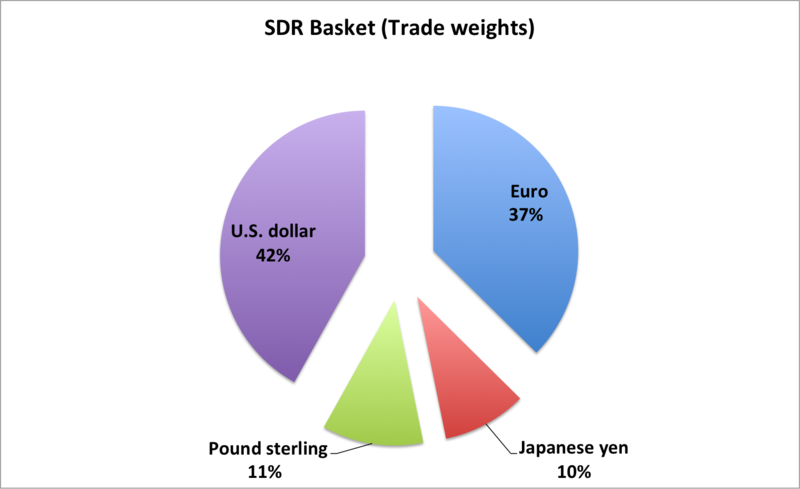 RMB inclusion in the SDR basket could well prolong the drop in the AUD, given the likelihood that the Australian currency (not a current or prospective member of the SDR basket) will likely lose share in global reserves alongside other non-SDR reserve currencies, such as the Swiss Franc. As a net importing economy (with significant trade ties to China), Australia’s purchasing power is vulnerable to shifts in Australian dollar valuation as well as in terms of trade, which in turn is of great long-term significance to the Australian superannuation system. Large asset managers worldwide ignore at their own peril large shifts in reserve assets, and Australian superannuation is no exception.